(NOTE: tuition will be $320 for the weekend, housing is extra. Sound is a universal pathway to Source. The conscious use of sound is one of the most powerful tools available to an energy healer. Shamanic Sound Healing is a potent form of energy medicine that can effectively transform our mind-body states, bringing new awareness and real healing attunement. The most powerful sound healing instrument we have is our own voice. It carries the vibrational essence of one's embodied truth, directly channels our emotional field, and can be a dynamic catalyst of personal evolution. This workshop is a transformational retreat imbued with deep commitment to integrity and grounded wisdom. 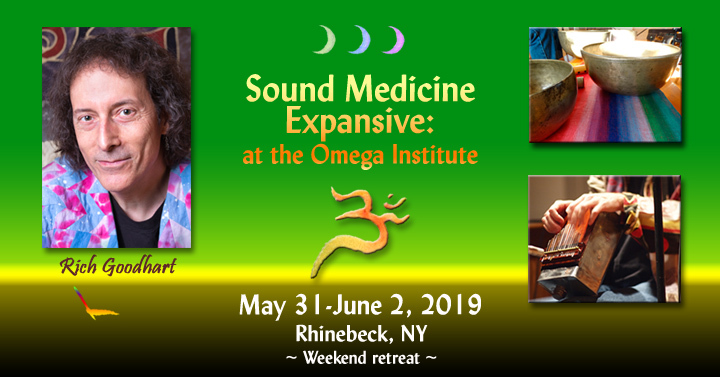 We learn group and personal sound practices in complement with master practitioner Rich Goodhart's richly multidimensional sound medicine immersions. We engage sound's ability to inspire healing responses, expansion, renewal in all aspects of our being. Rich brings lifetimes of sound, music and mystical experience, along with his collection of exotic world instruments, to inspire the journeys. Great for those looking to deepen their sound practice  and anyone interested in self-healing. Rich Goodhart is an internationally respected world music multi-instrumentalist, composer, recording artist, gifted master shamanic sound healer, Qigong/Taiji teacher, author and Omega Core Faculty instructor. His newest album of sound medicine meditations is titled Forest River Pathway. His second book of luminous invocations and sound healing essays is titled The Sound Inside The Sound. As the sound began to play." Copyright 2019 Rich Goodhart/Beginner's Mind Productions.